Situated in the Indian Ocean southwest of Sri Lanka, the Republic of the Maldives is a small tropical nation made up of about twelve hundred coral islands with a population of around three hundred thousand. The general population inhabits no more than two hundred of these islands; the rest are uninhabited except for eighty-seven used as tourist resorts for foreigners. Each island is composed of a ring-shaped collection of coral reefs, with a flat topography at a maximum height of just 2.4 meters above sea level, making it one of the nations most vulnerable to the effects of rising sea levels due to global warming. It is said that 80 percent of the nation’s land mass will be lost if the sea level rises by a single meter. In 1987, in fact, the flood-prone Maldives was hit by an extreme storm surge that inundated the capital island of Malé. The capital’s paralysis reportedly led to about US$6 million in damage. Inadequate drainage led to prolonged flooding and the spread of infectious disease. 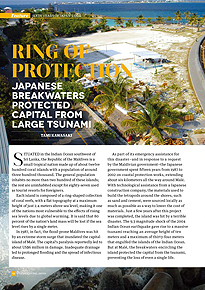 As part of its emergency assistance for this disaster—and in response to a request by the Maldivian government—the Japanese government spent fifteen years from 1987 to 2002 on coastal protection works, extending about six kilometers all the way around Malé. With technological assistance from a Japanese construction company, the materials used to build the tetrapods around the shores, such as sand and cement, were sourced locally as much as possible as a way to lower the cost of materials. Just a few years after this project was completed, the island was hit by a terrible disaster. The 9.3 magnitude shock of the 2004 Indian Ocean earthquake gave rise to a massive tsunami reaching an average height of ten meters and a maximum of thirty-four meters that engulfed the islands of the Indian Ocean. But at Malé, the breakwaters encircling the island protected the capital from the tsunami, preventing the loss of even a single life. After that, the Japanese government provided further grant aid in 2005 as well as a 2.733 billion yen loan for the rehabilitation of harbor and sewer facilities in 2006 as a tsunami damage reconstruction assistance measure. The Japanese people received the Green Leaf national environment award from the Maldivian government for the shore protection works. Gratitude in the Maldives for this aid is reportedly so widespread that over 80 percent of the population is aware of Japanese ODA. The trust built up between Japan and the Maldives through ODA since the 1980s came back to Japan in an unexpected way. When Japan was struck by the Great East Japan Earthquake in 2011, the Maldives conducted a fundraising and assistance campaign as a joint public-private effort, collecting donations equivalent to 46 million yen. The Maldives further provided about 690,000 cans of tuna, which are a precious source of foreign currency other than tourism, and delivered them to the disaster area in Tohoku. Exchanges have since continued at the citizen level between the two nations mysteriously brought together by the bonds of robust recovery from tsunamis. Japan Overseas Cooperation Volunteers and Senior Volunteers, as well as volunteers from nonprofits and NGOs, have been sent to work in fields such as disaster education and technical cooperation. In one such project, the volunteers worked together with local residents to build a monument using recycled blocks made from the debris left by the houses damaged during the tsunami; the monument not only helps people remember the disaster caused by the tsunami, but also serves as a sign marking an area for shelter in the event of a future disaster. In March 2015, the Third UN World Conference on Disaster Risk Reduction will be held in Sendai, which has recovered admirably much like the Maldives after suffering tsunami damage in the Great East Japan Earthquake. It will be a good opportunity to speed up efforts at expanding Japanese disaster prevention technology globally.